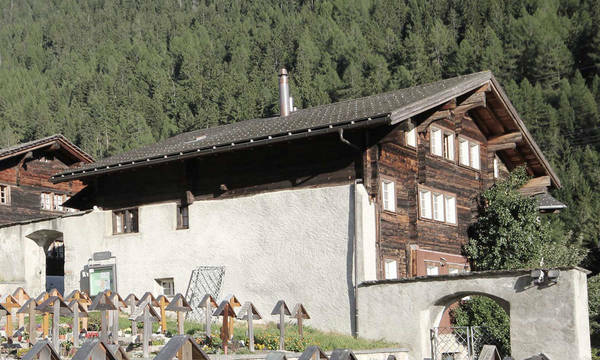 The house, built in the 18th century style of the Wallis region, stands at the entrance to the village of Ernen. 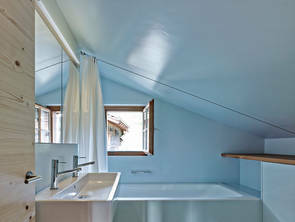 This house has now been renovated by Zimmer Schmidt Architekten. 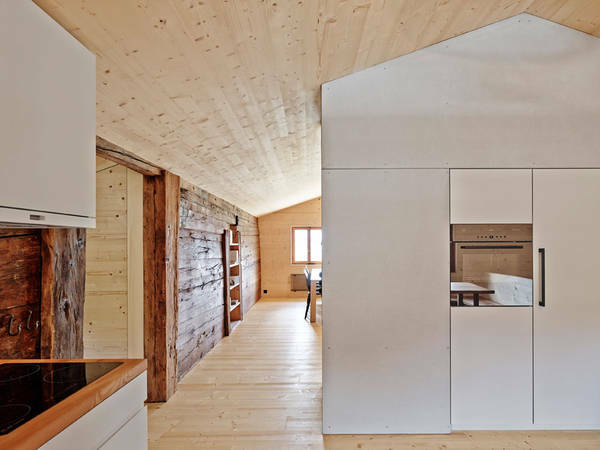 Its particular location became the underlying theme of the spatial transformation: the house is now defined not only by its view over the Rhone Valley, but also by the densely built village itself. 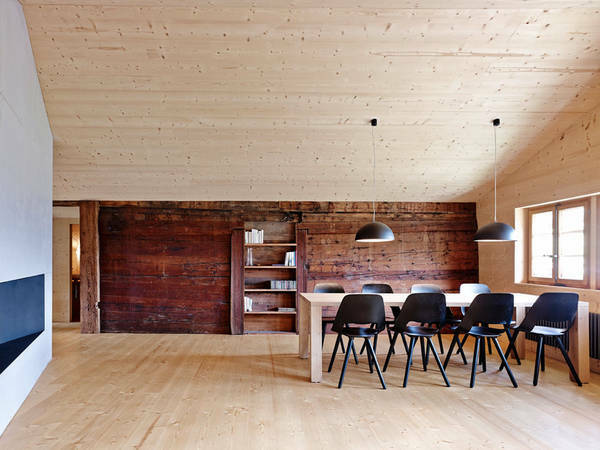 Working from the two separate holiday apartments originally found in the house, the architects have taken the location and orientation of the house in order to create a single holiday apartment that charms with its generously arranged living-dining-kitchen area. 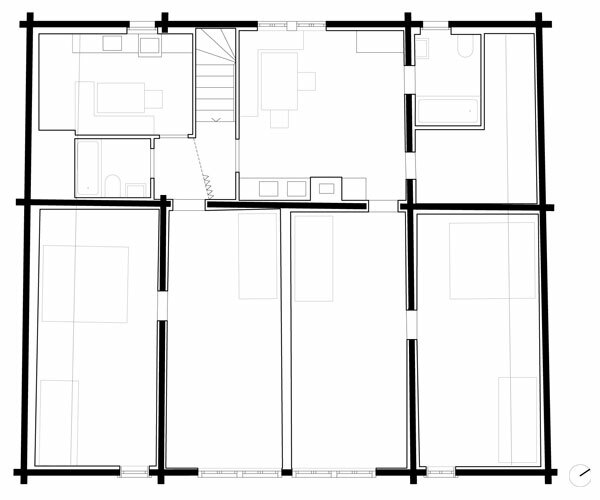 A new, central body divides the individual areas of the communal zone: the living-dining room is on the one side; the kitchen on the other side features a corner bench and another place to eat. The overhead kitchen cupboards, the storage areas and the old fireplace all have their place in the new furnishings. 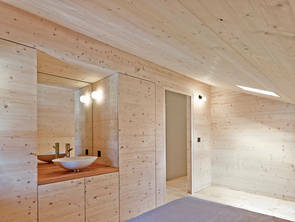 The white surfaces add an accent in the interior, which is otherwise done completely in wood. 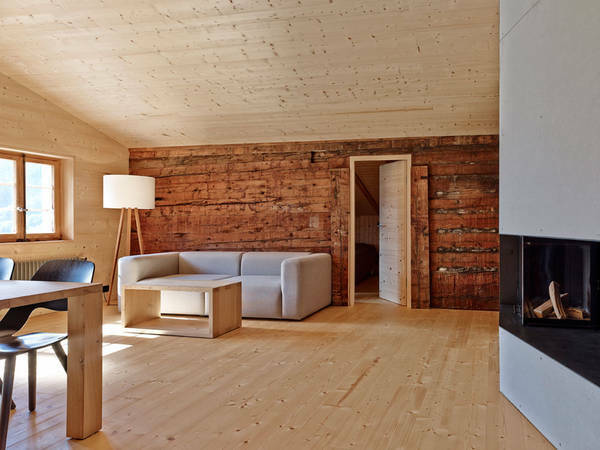 To prevent shifting from the movements of the old floor, the fireplace has been clad with fire-protection panels attached with visible screws and then hung on the dividing wall concealed behind the spatial element. 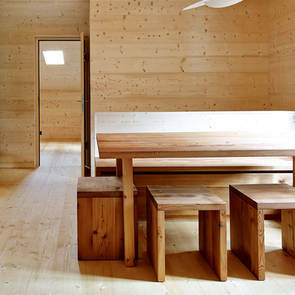 On both sides of the communal area, the exposed log walls running from east to west form a dividing wall that shields the laterally arranged bedrooms and bathrooms. By repositioning the doors to the individual rooms, the now unnecessary openings can be used as niches and small shelving units. In order to limit the palette of materials as much as possible, local sprucewood has been used for all new walls and flooring. The boards from the old screed floor have been reused and can now be found in the built-in fittings of the kitchen and bathroom. Thanks to their hardness and resilience, these larch planks make ideal work surfaces and seating as the corner bench in the kitchen. They have also been used as shelving in the bathroom.